Fiber is a substance found in plants. Dietary fiber is a type of carbohydrate we eat. Eating the right amount of fiber has been shown to have a range of health benefits. It helps you feel full longer, which can curb overeating and weight gain. Eating fiber-rich foods aids in digestion and the absorption of nutrients. Foods that are high in fiber can help treat certain issues. These include constipation, irritable bowel syndrome (IBS), and diverticulitis. 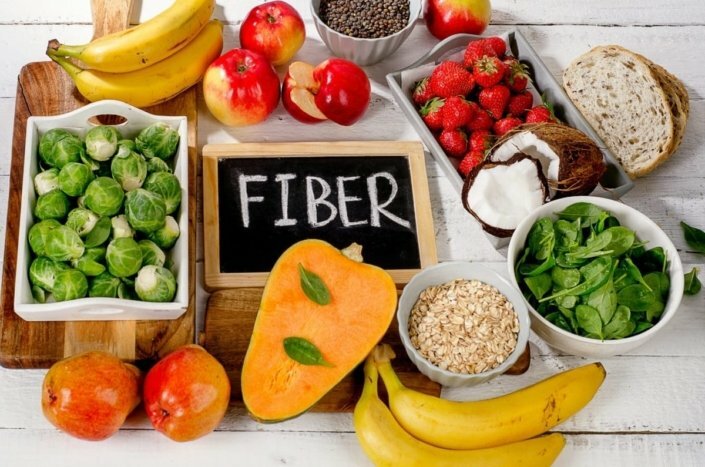 Dietary fiber can reduce your risk of coronary heart disease, type 2 diabetes, and some cancers. It also may lower your cholesterol. The amount of fiber you should get from your daily diet depends on your age and gender. Men 50 years of age and younger should consume at least 38 grams of fiber per day. Men older than 50 years of age should get at least 30 grams of fiber daily. Women 50 years of age and younger should consume at least 25 grams of fiber per day. Women older than 50 years of age should get at least 21 grams of fiber daily. The following changes can increase the fiber in your diet. Check nutrition fact labels for the amount of dietary fiber. Try to get 5 grams of fiber per serving. Add ¼ cup of wheat bran (miller’s bran) to foods. You can put it in cooked cereal, applesauce, or meat loaf. Eat ½ cup cooked beans, such as navy, kidney, pinto, black, lima, or white beans. Try not to add too much fiber to your diet at once. You may get symptoms such as bloating, cramping, or gas. You can prevent these by increasing your fiber slowly. Start with one of the changes listed above. Wait several days to a week before making another. If one change doesn’t seem to work for you, try a different one. Be sure to drink more fluids as you increase the amount of fiber you eat. Fluids help your body digest fiber. Try to drink 8 glasses a day. Choose no- or low-calorie beverages, such as water, unsweetened tea, or diet soda. Should I take a supplement to increase my fiber intake?